For about half a century, Londoners were given the possibility to get a week’s worth of entertainment for only one dime. This was The Penny Illustrated Paper. Born in 1861 after the Repeal of Paper Duties act, and with slight name changes – but nothing important enough to alter its identity, it was one the first English papers ever to spread to citywide readers. Seemingly, it was a close relative with The Illustrated Times, but nothing is certain, at least at the moment. Anyway, it eventually forged with the Illustrated London News and became a part of The Illustrated Times until 1913 when it – sadly – met its demise. 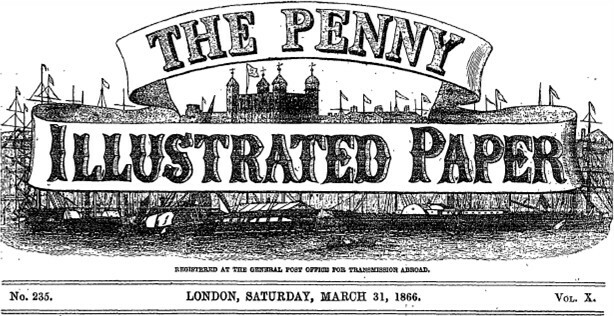 The Penny Illustrated Paper was nothing more and nothing less than a marketplace gazette. As the readers were not necessarily intellectuals – in fact they might have ranged from workers and shopkeepers to maids and such – the subjects touched were not exactly the most pretentious, at least not at the surface. In any case, the quality of the articles and illustrations is surprisingly good considering the low status illustrated press – and press in general – had in Victorian times , suggesting that their sources were anything but a group of dilettantes talking, writing and drawing jibberish. There is no surprise that Penny’s purpose was less to inform, in fact, it was created to entertain its readers. Its cartoons and comics avant la lettre remind their viewers of the carnivalesque with its subsequent chaos and hullabaloo. Nevertheless, the characters are not necessarily distorted, but the situations depicted surely are at least (apparently) peculiar. However, the fact that its demographics are so much wider than any other contemporary or older illustrated papers’ it gives today’s observers a much more authentic image of what life really was like for the most part of Victorian Londoners.